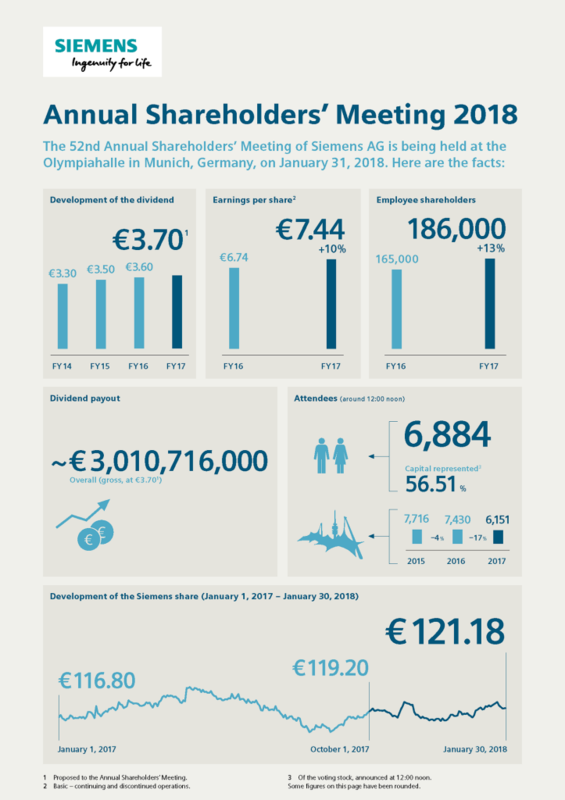 Siemens held its Annual Shareholders' Meeting at the Olympia Hall in Munich on January 31, 2018. Here you can find information on the press conference and documents of the first quarter results at www.siemens.com/pressconference. Jim Hagemann Snabe is the new Supervisory Board Chairman of Siemens AG. At today's constituent meeting of the new Supervisory Board, the 52-year-old software expert was elected to succeed Gerhard Cromme. Gerhard Cromme's term of office as Chairman and member of the Supervisory Board expired at the conclusion of the 2018 Annual Shareholders' Meeting. A member of the Supervisory Board since 2003, he had been its Chairman since 2007. The regular election of seven shareholder representatives on the Supervisory Board of Siemens AG will be held at the company's Annual Shareholders' Meeting on January 31, 2018. The current Supervisory Board has decided – based on the recommendations of its Nominating Committee ? to propose the election of four new shareholder representatives. The Nominating Committee of the Supervisory Board of Siemens AG has recommended Jim Hagemann Snabe for the office of Supervisory Board Chairman. Siemens' Supervisory Board unanimously endorsed this recommendation at its meeting on Tuesday. The regular elections to Siemens' Supervisory Board will take place at the company's Annual Shareholders' Meeting on January 31, 2018. Mr. Snabe is to be elected Chairman at the Supervisory Board's constitutive meeting immediately thereafter. The opening and the speeches of Dr. Gerhard Cromme, Chairman of the Supervisory Board, and Joe Kaeser, CEO, were broadcast live. Footage material and videos are available in broadcast- and web-tv quality in the GOMEX Newsroom. The footage can be edited or used in full length, in line with your editorial requirements.